K-Palette Real Lasting Eyebrow Liner is a Japanese brand that draws the most natural looking eyebrows with the right amount of translucence such that the color is deep enough to conceal sparse areas of your eyebrow but not too dark that it gives a severe, unforgiving tone. Plus, it stays put until you want it to. 👀 It’s available in 01 Natural Brown and 02 Grayish Brown. I’ve been using this for quite some time now. I got this idea from my make-up artist, Yami Parungao. This is what my eyebrows look like before Yami corrected it. My eyebrows are too thin. Nagsusunog kasi ako ng kilay dati. 😅 Anyway, Yami fixed it into this. She can do magic! With the help of K-Palette, she was able to make perfect eyebrows. Our eyebrows are the frame of our faces. It is vey important for us to make sure that we use the right eyebrow liner. K-Palette is true to its word when it says long lasting eyebrows for 24 hours. It can create thin and thick lines depending on what you prefer. 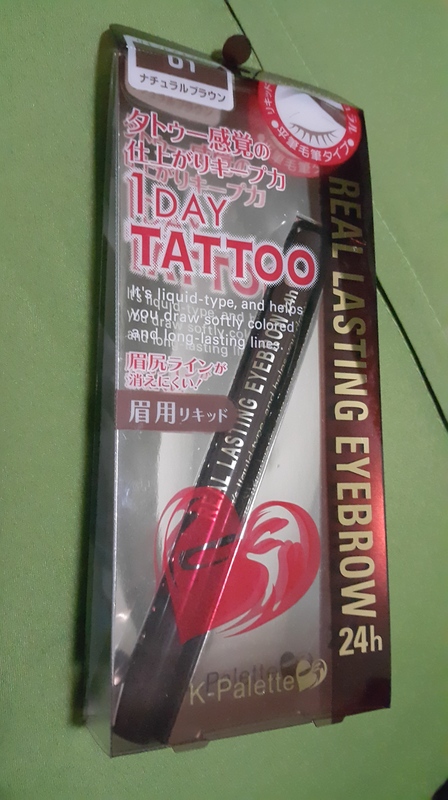 This one is liquid type and easy to slide and draw on your face. Thumbs up for K-Palette. Like their Facebook page by clicking here. Exclusively available at all Beauty Bar stores and Rustan’s The Beauty Source Shangri-la, Makati, Alabang Town Center. The best part about it is it’s price of Php 795 that lasts for 6 to 9 months. The downside of this product is when it dries up. I suggest that you do your eyebrows first before putting on the primer and foundation. In this way, your eyebrow liner won’t dry up easily. You can also use an eyebrow gel from Nars. It will help your eyebrows stick together in one place and will add more color to your eyebrows. Need a make-up artist for your wedding or events? Call Yami Parungao and like her page by clicking here. You won’t regret it. She and Ate Geng are a perfect match in doing hair and make-up together. They aren’t just good in make-up. They could be your next closest friend or make-up guru. There’s a genuine sincerity from both of them that’s why they excel in everything they do. For brides, you’ll forget about all the nervousness and stress once you talk to Yami and Ate Geng. They aim for perfection so all you’ll get is a perfect look. Here are some photos of Yami and Geng doing their own make-up.